Northampton, UK – June 16, 2015 - A new group of MST (Multi-Stream Transport) hubs has been released by StarTech.com and are especially helpful for increasing productivity by allowing users to easily multi-task between two, three and four screens. The new hubs are ideal for the design, gaming and medical imaging industries. These products will be especially useful for the increasingly popular digital signage displays and multiple monitors in an office setting. MST technology delivers fast and effective performance, further enabling photo and video editor professionals. 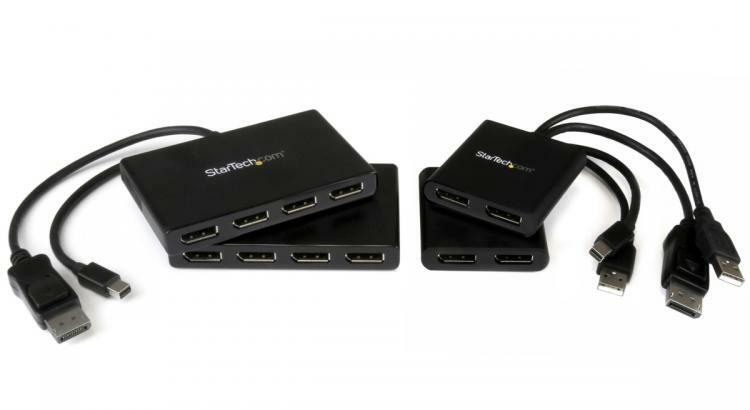 StarTech.com’s new hubs offer connections with Mini DisplayPort or DisplayPort and two and four outputs. MST Technology is a feature of the DisplayPort 1.2 standard and provides the ability to stream independent video content to multiple displays from a computer with a single video output. “MST technology is amazing in its ability to drive two, three, and four monitors from a single mDP or DP port,” said Karishma Punwani, Product Manager for StarTech.com. “Multi-monitor setups are no longer only for those with desktop PCs with high-end graphics cards which support multiple A/V sources. Moreover, MST hubs don’t sacrifice you CPU power because they leverage the computing power of your existing graphics card”. StarTech.com’s new MST hubs will be available from Insight, Misco, Amazon.co.uk and Dabs and is also distributed by Enta, Ingram Micro and Exertis Micro-P.